Table of Contents Next: Marston, John B.
Marston mat is an excellent example of a simple technology that made an enormous contribution to winning the war. It was used to pave airfields and roads and could be emplaced very quickly using unskilled labor. A 3,000-foot runway required just 1200 tons of Marston mat and could be laid by 100 workers in less than 100 hours. Since the key to victory in the Pacific was the ability to build functioning airfields on newly-captured territory as quickly as possible, the importance of this technology should be obvious. 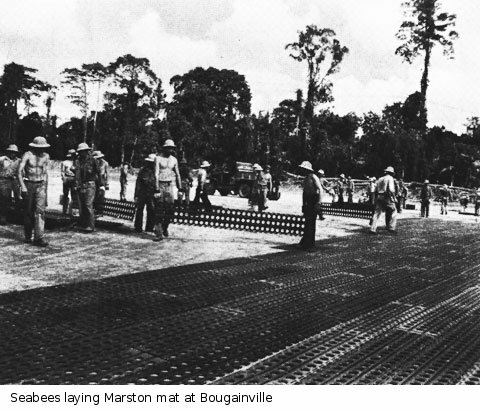 Marston mat was nothing more than perforated steel planks capable of being locked together at their edges. 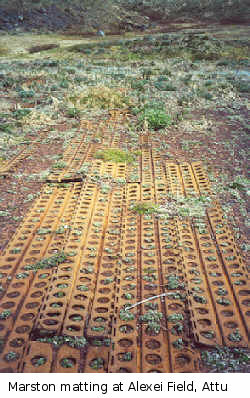 The perforations reduced the weight of the planks, improved aircraft tire traction, and permitted drainage. The edges of the holes were flanged, which improved structural strength and helped hold the planks in place. Each plank was 10 feet (3.05m) long, 15 inches (38.1 cm) wide, and 0.25 inches (6.4mm) thick and weighted 70 pounds (32 kg). Marston mat was best laid on 12 to 18 inches (30 to 45 cm) of crushed rock or coral, but in a pinch it was laid directly on ground as unstable as Arctic bog. 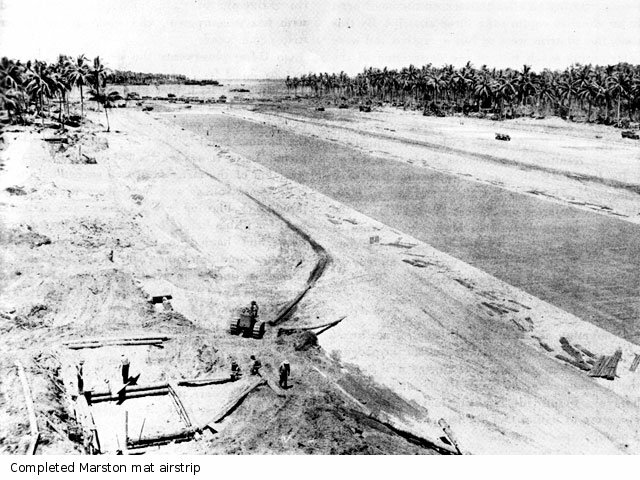 Commander Joseph P. Blundon described the task of repairing the Marston runway at Guadalcanal, where it came into use as early as September 1942. 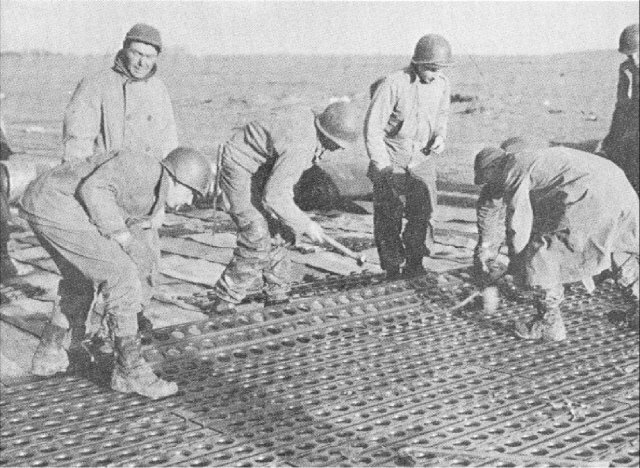 The Seabees constructed "repair stations" along the runway, each with foxholes for the repair crews and packages of 1600 square feet of Marston mat, the amount that experience showed was necessary to repair the damage from a 500-pound (227 kg) bomb. Trucks were preloaded with sand and gravel and concealed around the runway. Following a hit on the runway, the repair crews would clear away the damaged Marston mat as the trucks were brought out to dump their loads in the crater. 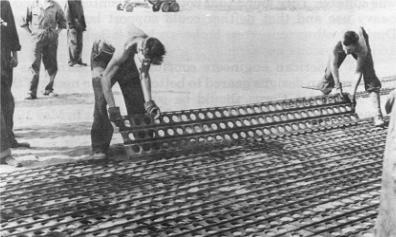 The the earth was packed down with pneumatic hammers and the replacement Marston mat set in place. Some use was also made of aluminum alloy planks. These were much lighter than steel planks even when thickened to maintain strength, but they were less durable and never fully replaced steel planking. 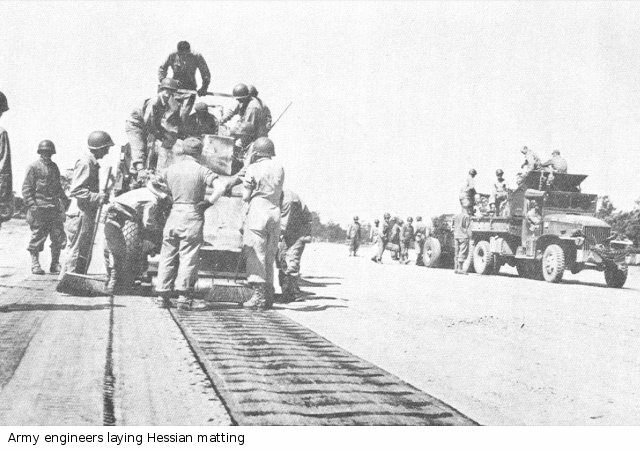 "Hessian" matting was asphalt-impregnated burlap which could be laid very quickly using a special "stamplicker" roller that applied solvent to soften the matting as it was laid. 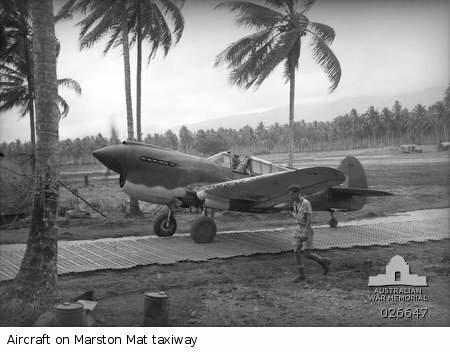 This was used extensively in Europe and for airfield construction in Assam, and it played a vital role in rapid road construction during Slim's Burma campaign of 1944. The British referred to it as bithess. it came in rolls fifty yards (45.7 m) long and one yard (91 cm) wide and was laid on a packed roadbed such that the strips overlapped by about eight inches (20 cm). However, Hessian matting does not seem to have seen much use in the Pacific. Its chief drawback was that it required vast amounts of petroleum products: The British estimated that a gallon each of gasoline and diesel fuel was required to lay a yard of roadway.